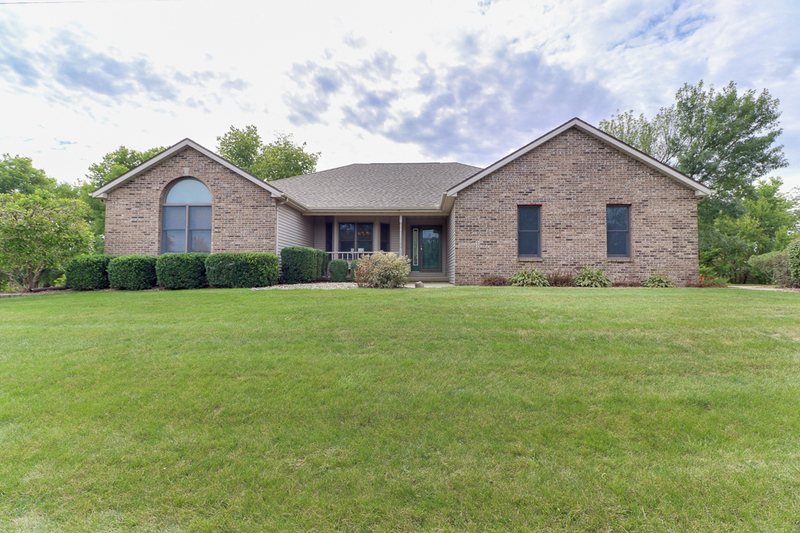 20199 N 1960 E. Towanda, IL 61776 – SOLD IN 3 DAYS! The rolling hills and beautiful views await you on this nearly 3 acre property in Towanda! Just minutes from Bloomington and Interstate access, but you’ll reap all the benefits of living in the country. Spacious Brick-Front Ranch with 3 Bedrooms and 2 Full baths, unfinished walk-out basement, vaulted ceilings, and tons of updates. Beautiful hardwood floors in the foyer. Floor to ceiling brick fireplace. Formal dining area. Three seasons room makes for a great coffee spot while you overlook the acreage. New in 2015 is the HVAC, Roof, Generator, Interior Paint, garbage Disposal, Storm Doors, Garage Doors and Openers. Home also features an attached 2 car garage PLUS another detached 30×26 2-car garage for all your hobby and shop needs! Fridge Negotiable. Propane currently 70% full. Whole house humidifier. Sand Septic filter installed either 05 or 06 to replace old septic system. Private Well. Culligan Water Softener. Woodburning fireplace currently has an insert in it. Detached 30×26 2 Car Extra Garage Built in 1998.